NOVEMBER 11 will mark the centenary of when guns fell silent on WWI, and across the region tributes will flow for current and former service men and women during this year’s Remembrance Day services. In Shepparton the service will commence at the Shepparton Cenotaph on Welsford Street at 10:30am followed by a three-volley solute at 10:59am, one minute of silence at 11am with the service concluding at 11:15am. The guest speaker will be John Gribben, a historian with a keen interest in local military history. A popular writer, speaker and local historic tour guide, John is going to share the story of a soldier named Edgar John Rule (or Ted as he was better known). Ted Rule, who after WWI married a local Cobram girl, and settled in Shepparton east, published his account of the war from his war diary under the title ‘Jacka’s Mob.’ One of Australia’s foremost war historians refers to ‘Jacka’s Mob’ as not just a book, but the Bible of the First World War. A Remembrance Day Service will also be held at the Mooroopna Cenotaph commencing at 10:30am. 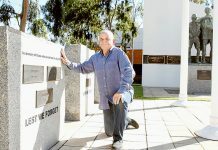 Although November 11 is a day of remembrance, it is also a day of celebration and locals are being invited to the Shepparton RSL Sub-Branch for an afternoon of festivities. At around noon there will be an unveiling and cutting of a special commemorative cake created and donated by Angela of Angie’s Cakes & Bakes. Club favourite, ‘The Real’ Paul Hogan will perform some well known classics in the members lounge and there will be food platters, free tea and coffee making facilities and, of course, the bar will be open for a bevvy or two with mates.